This week on Spellburn, we return from a holiday and deadline-enforced hiatus to welcome a guy that we’ve been trying to get on the show forever. 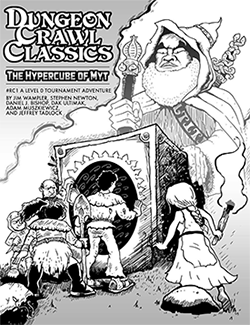 Tonight, we welcome notable publisher and author of third party adventures for the Dungeon Crawl Classics RPG, Thick Skull Adventures’ own Stephen Newton. Whoot! Time to bust open a cask of Dead Goblin Stout! Nice podcast, judges! I enjoyed Larvik Island quite a bit, and do not think that it is too long at all! It is “just right” from where I sit. Thank you, sir! I meant too long to bite off as a first adventure to write/publish, and I’m glad you enjoyed it. Whoa, pal! You’re not done until you bust out a Dungeon Denizen for us! During the podcast if I recall correctly Judge Jim mentioned that either Judge Jobe or Judge Jeffrey (I forget which) were off doing a D&D5E podcast. Did I hear that correctly? And if so what is the name of that podcast as I’d like to give it a listen. I need to make a trip to Cincinnati to play at Gateway Games. This has to happen. It sounds like they have too much fun there.